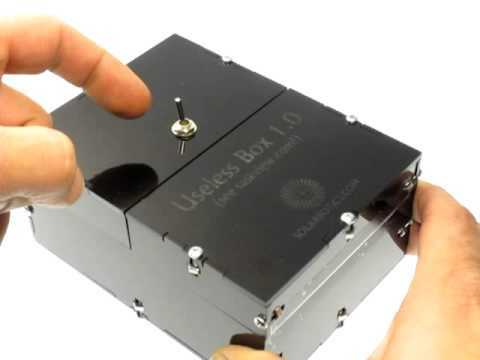 Build your very own useless machine. Switch it on and watch it automatically switch itself off. On, off, on, off — get hours of entertainment! What's a useless machine? It's a machine that you turn on and it turns itself off. Why on earth would you want one? Because it's so darn entertaining! The Useless Machine started out as a simple Instructable with a video, which quickly went viral. Since then the video has been viewed over 8.4 million times and the Machine has been featured in MAKE magazine and on the Colbert Report! Now you can build your own Useless Machine with a counter that counts how many times it's been useless! Solder The Useless Machine control board, then go on to solder the counter circuit. The kit was designed with beginning makers in mind and features a custom circuit board to make soldering the electronics a breeze. Expect the assembly to take about an hour, and the fun to last indefinitely! This version features laser cut acrylic hinges that offers years of trouble free operation. Make something useless today! Note: Requires soldering. Prefer not to solder? Try the solderless version! On-board counter that counts to 9999 uselessnesses.